Wolfsburg (13 September 2010). Volkswagen continues to set the pace at its “Dakar” dress rehearsal in Russia with a solid team performance. The 2009 “Dakar” winners decided the third leg of the Silk Way Rally in their favour: Giniel de Villiers/Dirk von Zitzewitz (ZA/D) celebrated the second stage win between Vyazma and Lipetsk on leg 03 of the rally. 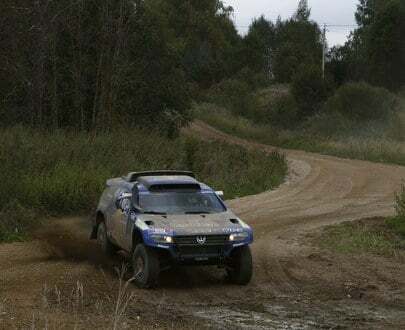 By finishing the special stage as the runners-up Carlos Sainz/Lucas Cruz (E/E) defended their overall lead. Five legs before the finish in Sochi their advantage amounts to 1m 19s. Third place today went to the duo Nasser Al-Attiyah/Timo Gottschalk (Q/D), who after four and a half hours of driving time are at an equal overall time level with de Villiers/von Zitzewitz. Mark Miller/Ralph Pitchford (USA/ZA) set the fourth-best time in the fourth Race Touareg. The third leg of the Silk Way Rally from Vyazma to Lipetsk primarily put the communication between the drivers and co-drivers to the test. Many branch-offs, forks in the roads and intersections required the co-drivers’ full concentration. The drivers were faced with a demanding gravel stage featuring many quick directional changes. On the third special stage the co-drivers announced instructions to the drivers about every 8.8 seconds. The roadbook for the 207.25-kilometre route included 62 pages and 307 pictures. Each picture contains up to four different pieces of information and is repeated three times on average. Additional reports on the news and sports programmes of TV channels n-tv, ARD and ZDF.